Calculating “Your Number”. Mine is $4.9 Million – Or Is It? Social Security – OK, so everyone’s saying Social Security isn’t going to be around in 30 years. That’s not the case. It’s not plausible from either an economics standpoint or a political standpoint. Will Social Security benefits be at reduced levels from what today’s seniors enjoy? Probably. The Social Security Retirement Age is on the verge of increasing. But it’ll be there. So, assume something in between today’s benefits and nothing. But don’t assume that you’ll get nothing. Conservatively, if I assume in today’s dollars I’ll be getting $2,000/month, that’s a lot different than zero. Pension – I happen to work at a company with a pension program. While many companies are doing away with pensions, there are millions of Americans that do have pension plans – especially in the state and federal ranks. In fact, many public sector employees get either full pension or close to it for life. This basically means they’re getting paid their working salary even though they’re not working! (See pension shortfall crisis) The ING model didn’t take this or Social Security into account. Other sources of income in retirement – People are starting to forgo the conventional retirement and go more into “transition”. This often means working a small side job, blogging, consulting, whatever. Many people find the prospect of a cold stop and doing no work for the next 25 years to be dreadful actually. As much as us working stiffs think we’d love to be able to retire at any point, many people approaching retirement say they can’t see themselves doing no work in their 60s and 70s and they say, instead of retiring, to ask them “what they’re doing next”. 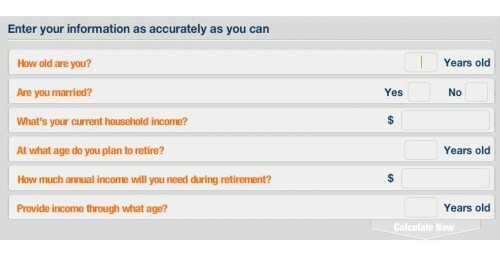 Assumed Investment Return in Retirement – If I enter “retirement” with several sources of income, I may be able to leave my nest egg in a more aggressive mix more geared toward stocks, whereas if I’m relying 100% on this nest egg and plan on say, a 3% annual withdrawal rate, I’ll need to make at least 3% annually to ensure I have enough to live on each year but take on minimal risk. If that were in today’s environment, you’d be talking about perhaps 2% annual returns, 3% if taking a wee bit of risk. But remember, if that’s my sole lifeline, I’d be unlikely/unwilling to take on equity risk and even perhaps bond risk. It may be all money market, CDs and the like. So, the point is that while some of these planning tools may seem like they’re providing useful information, often times, they’re not. They’re just too simplistic and don’t take into account real-world situations. My Number is $4.9 Million – Or Is It? As noted above, because I will have multiple sources of income above and beyond my sole nest egg amount, I will certainly not need $4.9 Million in the bank on the day of my formal retirement. I’ll probably need something more like 25%-50% of that. Sure, I’d love to hit that number, but in order to do so, I’d have to let life pass me by. Is it worth living an empty life to have died with $5 Million in the bank? Life’s a balance. My number is apparently $3.5 million. I think that’s a completely arbitrary number, and the younger you are, the worse it is. I’m 25 and I don’t plan on retiring for 40 years. I’m just making a guess at what I think my retirement income may be (which I’m sure is completely inaccurate considering it’s 40 years away). I think this tool may do more harm than good. My heart skipped a beat when I saw 6+ million. I started seriously planning & saving some 5 years ago (for retirement that is) and I’m still unsure what exactly my number needs to be much less what it is going to be. I now laugh at these six-questions-to-an-answer surveys. However, filling these out is what started me on the path to where I am now It gave me a start to what has been and will continue to be a lifetime of research and learning, tracking and adapting. Ugh… these are always so discouraging. I think it’s likely best if I just ignore those figures and work on eliminating my debts!